Hello again everyone! Three For Thurs is back once again. Let me know if you want me to keep this weekly post going as I’ve been um’ing and ah’ing as to whether or not to carry on with it! Give me some feedback! Here are my three must have this week! Hope you like! 3. This beautiful little number from Miss Selfridge is perfect for the Summer months that are (hopefully) just around the corner! Don’t worry though, it would look lovely teamed with some black or grey opaque tights and boots if , like me, you still need to wrap up warm! The floral print is gorgeous, and I love the unusual colour combination. 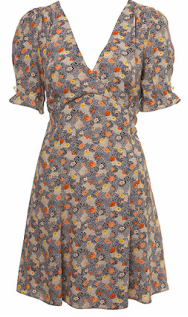 Ditsy prints are ALWAYS in fashion, and these colours mean it is really versatile and can be worn all year round. At £38.00 I think its quite a steal. Find it HERE. 2. I spied this little gem at my local Tesco the other day. As you may know, I’m starting to get a little obsessed with Tesco’s F&F range. They’re starting to get really stylish and on-trend, and their pieces are only a fraction of the price as those on the high street! 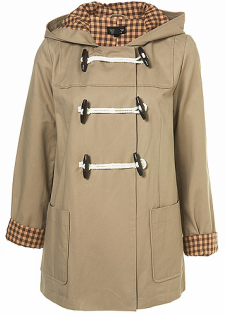 I’m going to be treating myself to this when I can rustle up some money from somewhere, as its only £16.00! Gorgeous for Summer. Imagine it worn open over the dress above, with a skinny waist belt and some pumps or gladiator sandals, or worn with leggings on its own? Very easy to wear and VERY affordable! Find it HERE. 1. This is a little beauty! 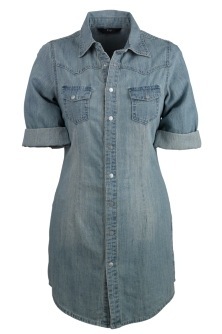 I spotted this last night on Topshop’s ‘New In’ section, and I’ve fallen head over heels for it. This lightweight duffle coat is THE perfect coat for those days where its too warm for a proper coat, and too cold to not wear one. I did want a mac, until I saw this one. I just wish it was a little cheaper, as at £70.00 its way out of my price range at the moment! I can just picture it with pretty dresses and bleached denim jeans. I can only wish! Find it HERE. What do you think? I love all three! I’ll be putting some stuff on eBay tonight so I’ll keep you all posted about that, and make sure you all enter the LuShae comp by clicking the badge in the sidebar!